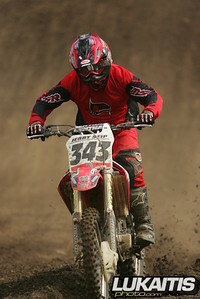 While the Supercross tour was in Sin City, Las Vegas for the final round of the 2008 Supercross Series Cochecton, New York’s Phil Nicoletti was getting ready for the outdoor series by tuning up at Raceway Park. Nicoletti has been to Raceway Park before and is certainly no stranger to the winner’s circle at the New Jersey track not far from his New York home. 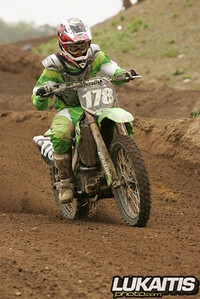 The Motorsports Outlet backed Kawasaki rider rode three classes and if his riding on Sunday was any indication his 2008 outdoor season looks strong. Nicoletti won 5 of the 6 motos he entered for the race day and looks to be well prepared for the upcoming national series. In 250 Expert class racing, Nicoletti was followed across the line in the first moto by Mt Holly Suzuki rider Ronnie Stewart and KPS/Montgomeryville Cycle Center backed Dakota Kessler. Those 2 riders would swap positions in the second moto with Kessler getting second overall due to his better second moto finish. 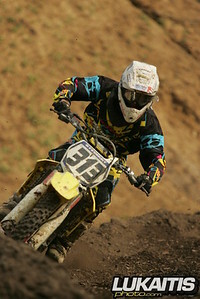 Nicoletti’s winning ways were extended in the Collegeboy class taking both moto victories. Mt Holly KTM backed Bryan Wallace went 2-2 for second overall and Honda-mounted David Szymanski went 3-3 for third overall. Nicoletti’s only loss of the day came at the hands of Kessler. After winning the first moto with Kessler in second and Wallace in third Nicoletti’s poor start in the second moto forced him to come from the back of the pack through a full field of Open Expert riders. Kessler went on to win the moto followed Wallace and Nicoletti. In 40+ Expert action, Honda duo Jerry Seip and Jim McIlvaine grabbed early leads in both motos and put on their own personal battle for the win. The Copper’s Honda backed Seip and Montgomeryville Cycle Center sponsored McIlvaine have been rivals for years but this day was Seip’s turn to take the top honors. Seip’s 1-1 took the overall followed by McIlvaine with 2-2 scores and Suzuki mounted Chris Prenderville went 3-3 for third overall. Seip also went on to win the 45+ class with Stanley Poulsen in second and Chris Suydam in third and was also second overall in the 30+ Expert class behind Honda rider Darren Edsall. McIlvaine was third overall. 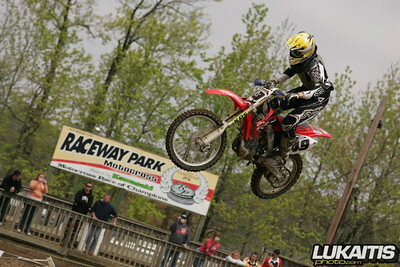 Check out Raceway Park’s website at www.racewaypark.com for upcoming events.